14% of Air India passengers were over 60. The most popular flight route for Air India was - Delhi to San Francisco. The top travel destinations for Air India passengers were Mumbai, Delhi, Hyderabad. The most popular airport for Air India was Indira Gandhi International Airport. Carriage of Liquor as Hand Baggage is Restricted in Direct Transit at Indian Stations! Air India has advised its Travel industry partners that security agencies of Indian stations do not permit carriage of liquor and other restricted items as hand baggage while in direct transit at Indian stations. Therefore, liquor bottles should not be purchased for carriage as hand baggage from airport duty free while departing from overseas stations if in direct transit at any Indian station for onward carriage. However, international passengers in transit on HUB & SPOKE flights at Indian stations can purchase liquor for carriage as hand baggage at the Indian transit stations after completion of security check for onward carriage; provided it does not exceed the stipulated total for hand bag carriage (8 kilograms max). Air India (AI) is the flagship carrier of India, with its main operating hub located at the Indira Gandhi International Airport. The airline's headquarters are situated at the Indian Airlines House, Parliament Street, New Delhi. 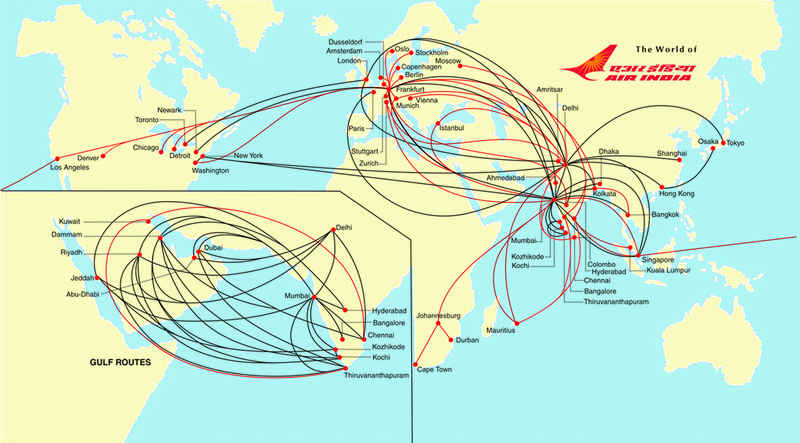 Air India operates scheduled flights across Asia, Europe, North America and Australia, covering more than 50 domestic and about 31 international destinations. Some of the famous destinations that the airline flies to are London, New York City, Shanghai, Bangkok, Mumbai, Dubai, Chicago, Abu Dhabi and many more. Starting from extra comfortable seats, exciting in-flight entertainment to delicious cuisines, the airline offers everything a traveler could ask for. Over the years, Air India has mastered the art of pampering its customers with nothing but the best. The airline offers three classes: First Class, Executive Class and Economy Class. First Class: Its luxury, comfort and excellent customer service all combined into one in the exclusive First Class. Seats offered can be converted into fully flat beds and come with features like ample legroom and headrest. Passengers are presented with exotic cocktails and can choose from a wide range of cuisines including Indian and Western. First Class also offers many entertaining channels where you can enjoy the latest movies, music albums and much more. Executive Class: This one is tailor made for the business travelers. With extra comfortable cabins, exotic wines and exciting collection of movies and music, Executive Class is where the real fun begins. Economy Class: Pay less but enjoy more in Air India's Economy Class. Passengers are treated with complimentary wines and have the choice of Indian and International cuisines. Seats are designed for comfort and come with exciting features like ample legroom and headrest. There are also well positioned screens for those who like to watch a movie while traveling. Just sit back and enjoy your ride with Air India. These are some of the amenities that Air India offers to passengers. •Wide range of Indian and international cuisines along with complimentary wines. Exciting in-flight entertainment system which includes everything from movies, music, television programs to magazines. Spacious and comfortable seats that are equipped with many features like ample legroom, headrest, superior reclining and much more. Air India offers three ways of checking-in: web check-in (www.airindia.com), mobile check-in and check-in desks. It's advisable that you check-in at least two hours before the flight's scheduled departure time as it gives you enough time to go through the security and baggage check procedures with ease. Always carry your boarding pass at all times as without it you won't be allowed to take the flight. Web Check-In: With Air India, it's possible to skip the long lines at the airport, all you have to do is opt for the web check-in facility. You can check-in from the comfort of your home or office by connecting to www.airindia.com, and you are good to go. Web check-in time ranges from 24 hours up to 2 hours before the flight's scheduled departure time. Mobile Check-In: Have an internet enabled mobile phone? Then no matter where you are, you can check-in online and select the seat of your choice with utmost ease. Mobile check-in is fast, efficient and saves you lot of effort. Check-In Desks: Passengers can also check-in at Air India desks present at the airport. Staff managing the desk is friendly and makes sure that your baggage is well taken care of. Get your boarding pass at the desk and get ready for an amazing flying experience. Air India operates a frequent flyer program named 'Flying Returns' which rewards passengers for their loyal relationship with the airline. The more you fly, the better the rewards become. Flying Returns: Flying Returns is India's first frequent flyer program and probably one of the most famous ones. Passengers are given mileage points every time they fly with the airline. The amount of mileage points awarded depends on the class of travel and also the total distance covered on flight. After you have hit a certain amount of mileage points, you can redeem them for special rewards like air tickets, access to lounges, priority check-in & baggage handling and much more. If you want to cancel or rebook your ticket, then you should go to the 'My Booking' link on Air India's website. For canceling a certain fee would be levied and passengers can get the remaining amount by applying for refund. For rebooking, again a penalty would be levied and passengers would also have to pay the fare-difference. Please apply for the refund procedure as soon as possible to avoid any hassles. If you can't travel on your scheduled date, then your ticket would hold no value. If an infant is traveling on your lap, then a push chair or stroller might be allowed without any charge, provided that the space requirements on the aircraft are met. Passengers can also carry sporting equipments but they'll have to follow the rules defined. If you are carrying a golf bag then it would be charged at the same rate as 6kgs of excess baggage is charged. Musical instruments can be included in the checked baggage category but if their weight exceeds the defined limit, it would be considered as excess baggage. Air India Hub - Airports used as transfer points to get passengers to their intended destination.